Merri Travels on Endurance.net: Happy Birthday, Mustang Lady! Naomi Preston is a sucker for a lame horse. "I had NO intention of buying a mustang. I was only going there to look," she says, of that fall day in 1982 when she was just looking at the BLM mustang herd in Boise. As a kid growing up in Cleveland, Ohio, she'd read all the horse books - The Black Stallion series, the books by Marguerite Henry, including 'Mustang, Wild Spirit of the West' - but she could never have a horse. Ten years later, one day the newspaper in Boise, Idaho, where Naomi was living, had an article and pictures on the BLM mustangs rounded up from the Owyhee range. She'd been to see the wild horses a few times, just to look. But that one day, she made the fateful mistake of asking the BLM wrangler how hard it was to train a mustang. Naomi rode endurance, but she'd never broken a horse in. It was just an innocent question out of curiosity. The wrangler answered that if you separated a mustang from the herd it was easier to deal with, "like this filly here," he showed Naomi, who was injured, so was being kept apart from the herd for her protection. "This skinny bay, lame two-year-old filly (who'd also aborted a foal) looked at me and took a couple of steps toward me and I was smitten - I felt sorry for her." And Naomi suddenly owned a mustang. It was the start of 28 years of true companionship and partnership, and an extraordinary adventure in the world of endurance riding with a symbol of the old Wild West - a wild horse. That one day long ago, Naomi had to borrow a truck and trailer to fetch her new horse. Mustang Lady was loaded onto the trailer via a squeeze chute, and Naomi drove her to her new home. Naomi wasn't quite sure what would happen when they got home; she backed the trailer up to a pen and opened up the trailer door. The half wild mustang hung out in the trailer for 20 minutes until she must have figured it was safe enough, and she hopped out into her new pen, and in true mustang fashion started eating the tumbleweeds that Naomi's other horses wouldn't touch. Naomi wasn't in any hurry to break her new horse in, as she was busy riding other endurance horses, and working full time. And she knew it was best to let Mustang Lady bond with her. "She would stick her nose through the fence when I was working near her pen, not touch me, but get near me. She started shadowing me around, and getting to know me, and eventually I could touch her." In fact, it took Naomi a week just to get a halter on her horse. "I started with the grain idea - mustangs don't know about grain - I got her eating grain out of a bucket, then I'd put her halter in the bucket, then I'd slip it up onto her nose, doing it day after day - and I finally got the halter on her with no problem." She was so excited that she ran into work telling everybody, "I got a halter on my wild horse!" The first time Naomi got on Mustang Lady was after she'd turned 4, and by then, it was really easy. The filly never was a problem to ride, although she was a bit willful at times. On one ride, Naomi figured out that some of her antics were just a mustang's innate ways of avoiding possible danger - like scrambling up a hill (much to Naomi's chagrin) through a rocky section instead of following a narrow trail with high sides. Once they were riding along a hill when Mustang Lady suddenly hauled to a stop, and Naomi couldn't get her to move. "She FROZE, alert, ears up, and she let out this blood curdling scream," as if the terrain suddenly reminded of her home or some past experience. "I've never heard that again. It gave me goosebumps. But it was way cool!" 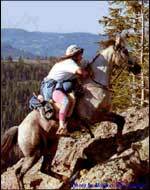 Their first endurance ride, in 1986, was appropriately named the Owyhee Wild Horse ride; that was one of 8 rides that Naomi and Mustang Lady successfully completed that year. Despite that, however, Naomi didn't think at first that Mustang Lady was going to amount to much of an endurance horse. When she was stubborn, Naomi says, she'd get really stubborn. "She had quite the Attitude. She used to drive me crazy, the first 3 years I rode her. But as we started going longer distances, she got better, and she got better as she got older." Those longer distances included - in their second season of 15 starts and 15 completions - two 75 mile rides (5th place, and a 1st place and Best Condition), and two 100 mile rides (9th place and 2nd place). Then, in their third season, came the Tevis Cup. Naomi didn't know much about the ride - she'd just heard about it and it sounded like something she wanted to try. "During the ride, Mustang Lady was fine, but I got heat stroke at Francisco's [at 85 miles], and stayed there an extra hour recovering. We still finished 16th. I vowed not to be the weak link the next time we did it - after that, we trained in the heat. I'd been avoiding it before." That was the first of four straight Tevis Cup finishes for Mustang Lady. They finished second in 1990. It was "an amazing year," Naomi says. Mustang Lady completed all 13 of her starts - finishing 11 of them in the top five, with 1 win, four seconds, three thirds, and two Best Conditions. Mustang Lady was the National Champion that year. In those days, horses and riders had to do three 100-mile rides, two in their own regions, then the National Championship which was a 2-day 150 mile ride; and the horse with the most points won it. It was Mustang Lady that year. 1991 was something of a phenomenal year, also. After finishing in the top ten in a 75, and four 100s, Tevis was coming up again. "I couldn't decide if I wanted to do Tevis again for the third time, or the Race of Champions. The ROC would be 160 miles over 3 days in Montana, basecamp at 6000 feet, a really tough ride, and I figured Mustang Lady would do well. I really wanted to ride her solo with no crewing help." And so she decided on the ROC. A film crew followed Naomi and her mustang during the ride - in which they placed 9th - and they followed her home. "Two days later they wanted to film us some more on our home trails. I didn't want to do it; I told them Mustang Lady would be tired, but in the end I agreed to go out and do some easy little training shots" for the filming. Mustang Lady had apparently forgotten all about the ROC. "She was PULLING ON ME - I said, 'We're going to Tevis!'" Tevis was 2 weeks later - they finished 4th. "Mustang Lady was a great downhill horse - she was known as the Queen of the Downhills. That's why she was so good at Tevis." And there was more to come - 4 weeks after that was the North American Championshipss FEI ride in Carson City, "a really tough ride, trails around Carson then some of the Virginia City 100 tough trails." Naomi and Mustang Lady ultimately finished third behind Darla Westlake and World Champions Becky Hart and her phenomenal horse Rio. On the podium getting her bronze medal, Naomi told Becky, "It's an honor to be up here with you!" Becky told her, "We thought you were gonna catch us!" That year Mustang Lady was dubbed the 'Triple Crown' winner - no other horse had done all three rides - the Race of Champions, Tevis, and the North American Championships. That was followed by yet another great endurance year in 1992, and an unparalleled honor for Naomi - Mustang Lady and Naomi made the US team for the World Endurance Championship in Barcelona, Spain. In the final 100-mile tune-up for the WEC, in Kananaskis, Alberta, Canada, coming into the first vet check, Mustang Lady finally wanted to drink water. They stopped at a little pond, Mustang Lady took a drink, her hoof sank a little bit - then she went down in quicksand. "All of a sudden we had sunk in to over my knees!" Naomi jumped off and got to the bank, and she stood there in shock, thinking "I'm going to lose my horse!" While she was deciding what to do - try to get back in the quicksand to Lady to try and pull her out, or run to the vet check for help, Lady lunged three times and managed to get herself out. "She was dripping mud... and blood on her hind legs. I thought, 'that's it, we're done.'" Naomi walked her horse into the vet check and got her cleaned up - and she vetted through fine. Naomi decided to go on, thinking Lady must be alright, "but she wasn't fine for long. At the next vet check, she was lame - amazing what adrenaline will do for a horse." Mustang Lady had ripped her hind tendon (so badly she was put in a cast). "And that was the end of Barcelona." However, that turned out to be a blessing in disguise. Because a wave of African Sleeping Sickness was going around, the US horses had to quarantine in France for 3 months - and there they got piroplasmosis from ticks, and all had to go through chemotherapy (one gal sold her horse there, instead of putting the horse through treatment to get it back to the US). "I never would have left Mustang Lady in Europe for 3 months. We would have had to move there! "But, we had made the squad, and that's something I'm quite proud of." Mustang Lady had a year off after her injury, then successfully returned to competition in May of 1993, finishing in the top ten in a 50 mile ride. It was then Naomi decided she wanted to ride in Europe. 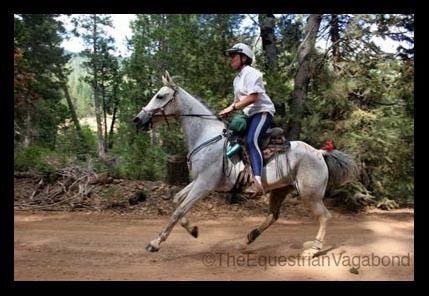 "I thought it would be cool to ride an international European ride, so I went to an FEI ride in Sherwood Forest to ride a borrowed horse... and I got the Horse From Hell." During the ride, they got buzzed by a model airplane on the trail, and her horse went crazy. "He went Mach 10 into a field, got to this big ditch and jumped it, kept going and came to another big ditch, and I think I bailed on that one. I woke up wth a concussion, had lost two teeth..." It resulted a few months later in neck surgery for 2 herniated discs - two weeks before Tevis, that she'd planned to do again with Mustang Lady. Instead, her friend Lori Stewart rode Mustang Lady to her fourth consecutive Tevis finish. And, because Naomi was having too many complications after her injury, and she was doubting she'd be able to ride much, she decided to breed Mustang Lady. After Tevis, Naomi dropped Lady off with the outstanding endurance stallion, Wazirs Karahty. 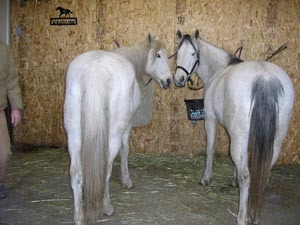 The result was Karlady - which turned out to be Mustang Lady's only foal. "Lady had colic surgery when she was 20, and the vet advised that she not be bred again... so I never did." 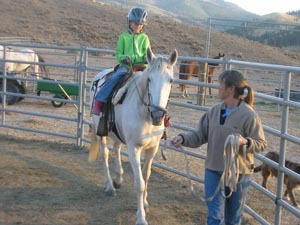 Naomi's injuries persisted, and she rode Mustang Lady only a few more times over the next two years. Though Mustang Lady's AERC online record is missing a few rides, it shows in impressive 11 seasons of competition, 5255 miles, 72 of 73 rides, 25 of 26 100's, 6 Best Conditions. Her career was exceptional. 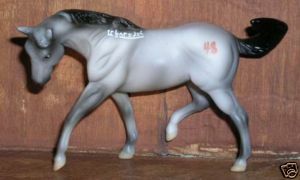 She even had two Breyer models made after her. She was inducted into the AERC Hall of Fame in 2001. Mustang Lady loved her job. "Ahhh - she was a DREAM to ride!" recalls Naomi. "Smoother than smooth. My God! She was really sure footed, amazing. I never came off of her. She was 100% rock solid." And she could skip over Cougar Rock in Tevis. "If you've seen videos of horses going over Cougar Rock, you'll see a lot of them slipping, stumbling, tripping - Mustang Lady just waltzed over it like it was a walk in the park, no anxiety, nothing to it. I trusted her, she was totally solid." As they went over longer distances "she was great - she could keep up that moderate steady pace all day long. Some horses when they hit 80 miles in a hundred start to sag - Mustang Lady just got stronger. She was consistent and steady, and she LOVED it. We both loved riding in the dark. She got really strong at the end, and we'd pass riders. We both really liked that! I'd rather be steady and finish, than to go fast and win a few races." Despite Mustang Lady being a dream to ride, however, she still had some Attitude. "She'd pin her ears going down the trail if someone wanted to pass her - she was very competitive on the trail - and she never trotted out pretty for the vet checks or for Best Condition judging. She thought, 'This is stupid!' I always had to work with her on trotting out." At their bronze medal ride in the AERC National Championship, showing for Best Condition the next morning, Mustang Lady put on a show. "She looked so good, everybody's watching, all these FEI vets and officials were there; we started trotting out, and Lady reached over and bit me hard on the arm and I screamed!" When they finished their trot out, head veterinarian Mike Tomlinson said to Naomi, "They call her Mustang Lady - but I don't know where they get the 'Lady' from!" Karlady has inherited a few of her dam's traits - namely the Attitude. Naomi has come off of Karlady in rides "a few times," she says, though she laughs about it. Naomi didn't start riding Karlady in endurance until she was 11. Since then, they've begun compiling their own impressive partnership: 52 of 56 rides completed, including first place in the AERC Northwest region in 2009, and 3 times the winners of the 5-day, 260 mile Owyhee Canyonlands ride. And just last weekend, Karlady got her 3000 miles. This July Naomi celebrated Mustang Lady's 30th birthday. No big fanfare, just her and Naomi and some treats, and, undoubtedly, some heartfelt hugs for the once in a lifetime mustang that changed her life. "She moves a little slower now, but she doesn't act old, and she doesn't have a sway back. She's teaching the grandchildren how to ride." And there are still many more miles of endurance trails to see between Karlady's ears - to carry the legacy of her great mustang mother onward. I remember watching Mustang Lady in one of the ROC's. What an amazing horse. "Run Like the Wind, Bullseye!"